Alice Childress’s 1955 satire of race in show business resonates both as hilarious send-up and historical document. Childress’s rarely produced 1955 satire contains an implicit and scathing critique of the theater—or show business, as Wiletta Mayer (the excellent Velma Austin) prefers to call it. As a meditation on artistic identity and race relations, Trouble in Mind anticipates the work of Ntozake Shange or Young Jean Lee’s The Shipment, confronting its audience and indicting a culture that often chooses to ignore injustice. 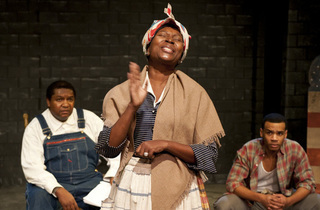 The story follows Wiletta’s awakening to the realization of the price she’s paid to work as an actor. Childress understands that theatrical collaboration involves compromise—but she asks why African-Americans (and women) must pay a larger price to play this game, perhaps losing any sense of artistic integrity in the process. “I’ll be damned if I wear another bandanna!” Millie Davis (Kelly Owens) complains; in Act II, she’s wearing that bandanna. Like Wiletta, she’s made a career playing to stereotypes for white audiences. Childress’s script is often hilarious as it follows the silliness and conflict of the rehearsals for the play-within-the-play. John Mossman is especially good as Al Manners, a director out of Waiting for Guffman, whose pretentious (and abusive) directorial style doesn’t render him completely unsympathetic. In fact, each character has depth, and the fun of the script buffers the incredibly painful and somehow surprising climax. 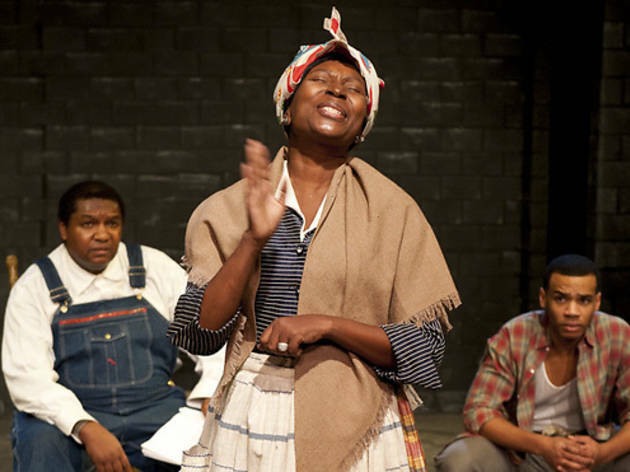 Sheldon Forrester (Cola Needham) narrates a haunting memory of witnessing a lynching, and Wiletta decides, finally, to speak truth to power, no matter the cost.